There has been large controversy over odd creatures that lurk the woods, hills, and even the snowy Himalayas. A "Bigfoot" like creature that is about 6 ft tall and upwards of 500 pounds. A mysterious muscular, bipedal creature that resembles an "Ape-man". This can be referred to as the yeti, or the abominable snowman. This is just another example of cryptozoology which is the study of "hidden animals". Since the early 1900's there have been many sightings of hikers and mountain climbers that claim to have seen a yeti or had found evidence claiming its existence. Although there have been captured images of this so called yeti and abnormal footprints documented there has been no clear evidence to prove the yeti's existence. One hiker claims to have found a yeti scalp back in 1960 but that was quickly stomped when the scalp was quickly identified as the scalp of a serow, an animal in the Himalayas similar to a goat. Another man claims to have found a yeti finger in a monastery in Nepal. It simply ended up being a human finger of the corpse of a monk. All evidence that seems to show up, ends up getting debunked. Despite the lack of real evidence, There is still a strong group of believers. In 2011, the Russian government sent people to search for the yeti. They only came up with evidence that was later found out to be hoaxed. 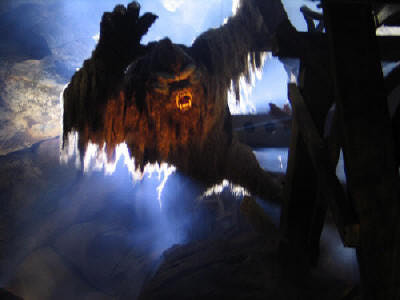 Also, in Walt Disney World there is an entire attraction based around the yeti and its existence. They even have what is claimed to be a yeti footprint on display while you wait in line to go on the ride. Most likely, people are mistaking this so called yeti for a Himalayan brown bear which are common in the area. Growing up knowing that the earth is round, it would be pretty difficult to be convinced that it's actually flat. Also, it's not flat so no one in their right mind would believe that. However, there are still people who believe that it is. Known as the Flat Earth Society, this group is dedicated to promoting Rowbotham's ideas (that the earth is flat) and try to convince skeptics to join their side. They believe that the earth is a flat, disc-shaped planet that accelerates upward, producing the illusion of gravity, They also refuse to accept obvious evidence like actual photos of earth from space. This group is questioned by many skeptics, but they always seem to have a rebuttal to every argument thrown their way. But, there are so many ways to prove that it is round. During a lunar eclipse, the Earth places a shadow on the Moon's surface, and it is oval-shaped. Another way is that when you're looking at a ship out on the horizon, it doesn't just appear out of the horizon, but it looks as if it's emerging from beneath the waves. Also, while moving away from the equator, one sees different constellations. Next, shadows from still objects move as time passes. Another piece of evidence would be time zones existence. Lastly, photos of earth from space is the most convincing piece of evidence that we have to prove that the earth is most definitely not flat. We have sent many rovers and satellites to the mysterious "Red Planet" and NASA has been trying to get a better understanding on the planet conditions and its history. While observing rock formations and landscapes of the planet, some of our cameras have picked up some pretty strange objects. 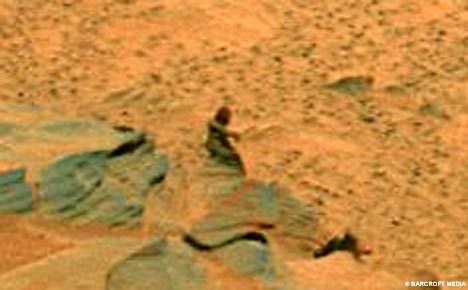 From the notorious "face on Mars" and other photos that show what looks to be a women statue or even a thigh bone on the surface. When looking at some of the photos they do look a little strange but people took these sightings as remains of aliens or possible aliens living on Mars today. However, most, if not all of these weird objects have been either explained or debunked. Some of the pictures like the "face on mars" are simply weird rock formations according to NASA. Other controversial pictures like the women statue are simply optical illusions or the photo was taken at the precise angle for it to look like something that it is not. Many people believe that dreams are a reflection of what is going on in a person’s life at that moment in time. Dreams occur during REM sleep, which is typically 20-25% of sleep time. In some dreams, the dreamer is an observer, even an observer of himself. People often try to lucid dream, or take control of what is happening. They attempt to place themselves in an altered state of consciousness. This can not possibly be true, as there is no physical way to make your body leave and come back. People must train themselves to sleep in such a way where they believe to be controlling their dreams. Instead, they are actually training themselves to subconsciously remember their dreams. They wake up thinking that they controlled the actions that were done in their sleep, but that is not actually the case. People that claim to have lucid dreamt also believe to see “dream signs”. These are up to interpretation and are not actually true to real life situations. Some dreams can seem very realistic but in reality are just as real as the dreamer perceives it to be. The Fountain of Youth is a mythical spring that supposedly contains water which will heal and restore the drinkers youth. Bathing in the fountain will give a similar result. Some variations of the legend say that not only will your youth be restored, but you will also achieve immortality. These stories originated in the Caribbean islands around 400 BCE. 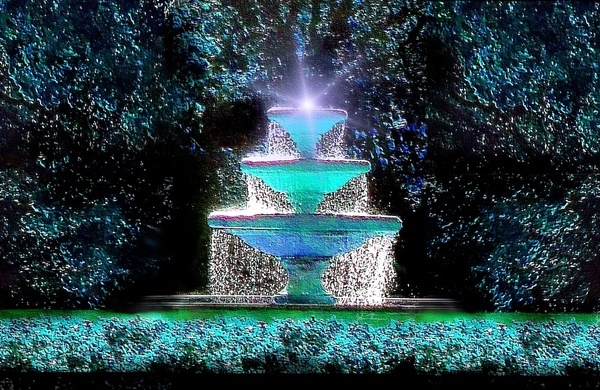 Around the early 16th century, during the age of exploration, a Spanish explorer named Juan Ponce de Leon set out to find the fountain, after hearing about it from the locals of the islands. It is said that the fountain is from across the "land of darkness". The original tale accounts for Alexander the Greats servant crossing this land to obtain the holy water for Alexander. This water proves to not be the true water from the fountain of youth, as Alexander the Great is recorded to be dead. The Fountain was not only a legend in the Caribbean Islands. Cultures everywhere had different stories and variations of the Fountain of Youth. Just like Spain, the other countries sent out explorers to find the Fountain, with no success. To this day, no one has found the Fountain, but there are those who still try. We've all woken up on the "wrong side of the bed." Yet in the world of folklore and superstition, there really is a right and wrong way to get up in the morning. According to Ancient Egyptians, waking up on the left side of the bed has bad consequences and waking up on the right side will bring you luck. It is believed that you are supposed to exit the bed the same way you had entered it or else your sleep cycle will be disturbed until you can resume sleeping the next night. The Jersey Devil is a legend that has been around for years. Many people believe that this creature is located in the Pinelands and is an animal-type of creature that resembles a flying llama with large wings. Over the years, many people have had experiences and even claim to see the flying creature throughout South Jersey. Many people know the story of Mrs. Jane Leeds and how she came from a poor family who eked out an existence in the Pine Barrens of Jersey, a rugged place with vast forests, sandy soil and patches of swamp. In 1735, Mrs. Leeds discovered that she was pregnant with her 13th child. She complained to her friends and relatives that the “Devil can take the next one”, and he did. When the baby was born, he was monster! He immediately took on a grotesque appearance and grew to more than 20 feet long, with a reptilian body, a horse’s head, bat wings and a long, forked tail. He thrashed about the Leeds home for a bit and then vanished up the chimney. The creature, or the “Jersey Devil” as he was dubbed, began haunting the Pine Barrens. To this day, people claim that the Jersey Devil is real. During the 1930’s, the Irving family of the Isle of Man reported strange occurrences. They started to hear a voice inside the walls of their house. The voice claimed it was a mongoose from India named Gef that was born in 1852. Gef would often give dead rabbits to the Irving family and converse with them. He would also sing song for the family. Gef had a temper and once exclaimed to Mr. Irving when he was taking too long to read the newspaper, “Read it out, you fat-headed gnome!” In 1947, the new owner of the house captured and killed an animal that resembled the description of Gef. Psychic researcher Harry Price investigated the Irving house and found no evidence of a talking mongoose. Gef’s hair and paw prints he provided Price matched those of a dog. 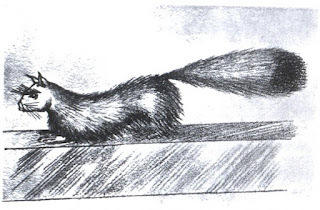 Most likely, Gef the mongoose was a hoax the Irving family played on the public. In the small town of Point Pleasant, West Virginia, there have been sightings of a mysterious creature called Mothman. The creature was first sighted in 1966 by the Scarberry family when they were out for a drive. 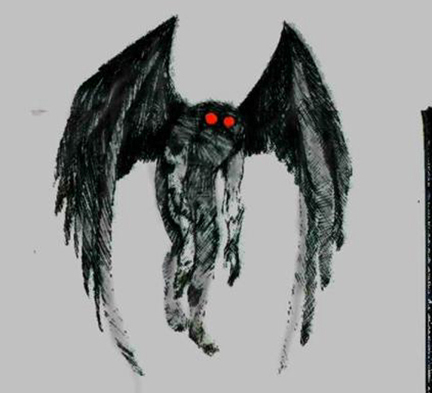 Mothman is said to be seven feet tall with wings and glowing red eyes. On December 15, 1967, Mothman was spotted standing on top of Silver Bridge which connected Point Pleasant, West Virginia to Gallipolis, Ohio. Later that day, the bridge collapsed. Some claim that Mothman is an alien due to reported UFO sightings around the time of the incidents. Mothman was most likely a misidentified bird. Skeptics of the Mothman legends suspect that the creature is actually a sandhill crane, a bird with red skin around its eyes. The ancient Romans believed that human life renewed itself in 7-year cycles (mirroring the cycles of the moon). A reflection was believed to be someones soul. If that reflection got shattered then so did the next seven years of someones life. That would mean that for the next seven years that person would have constant bad luck. It is also believed that infants could trap them and stunt their growth. Plus, they could take their innocent souls. 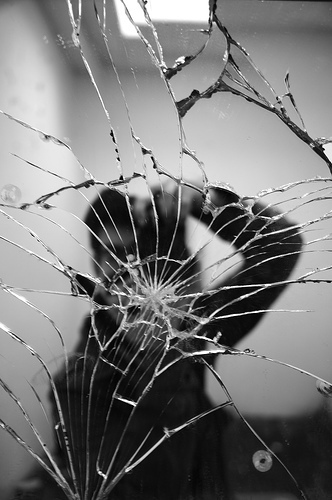 Once you break a mirror it can be a tough process to counteract the negative effects. In addition, it is believed that a mirror has the power to confiscate part of the user's soul. If the user's reflected image became distorted in any way, this could mean a corruption of his or her soul. SO if the mirror was then broken the users soul would be trapped. After breaking a mirror, since the pieces of the mirror can still reflect the corrupted soul, the entire mirror should be ground into dust. Afterwards, you have to bury the pieces of the mirror under a tree during a full moon. Spilling salt is know around the world as a bad omen. To get rid of the bad luck, many believe to throw a pinch of salt over their left shoulder. Spilling salt is bad luck because many believe that Judas spilled salt during the last supper. Another belief goes back to when salt was extremely expensive. Since it was so expensive spilling it meant that you would have future bad luck. A German proverb said that "whoever spills salt arouses enmity." Folklore even linked it to unlucky omens in order to prevent wasteful behavior. Basically in history it has always been bad to spill salt. Apparently, spilling salt is associated with treachery and lies. If you throw salt over your left shoulder it is supposed to blind the devil that is waiting there. The the legend is that the devil is always standing behind you, and throwing salt in his eye distracts him from causing trouble. 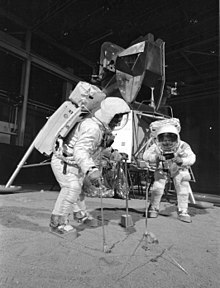 In an article i read written by Phil Plaits he analyzes the arguments that suggest that the moon landing did not occur and then he counters these arguments proving how ridiculous this theory really is. One major point that they try a and make is that there are no stars visible from the video or pictures from the moon landing, suggesting that it must be faked. Plaits argues that this is an observation of someone who doesn't understand any sort of astronomy. The moons atmosphere is much darker then our own which makes the stars very difficult to see, as well as when the shots were being taken of the landing the sun was very bright and and reflected harshly of the moons surface and the bright white spacesuits that the men were wearing, therefore they had to set the camera to a very dark setting to only allow a small amount of light in so they would be able to see the astronauts. At this setting there is no possible way that the dull stars would be visible, the same would occur if you used that setting at night on earth. Another argument that they make is that there is no blast crater from the spot where the spacecraft landed, and that it would considering it could touch down with 10,000 pounds of thrust. However plaits argues that just because it could come down with that much thrust hardlt means that it would, or even should. The men piloting the shuttle would obviously ease up on the throttle and touch it down around 3000 pounds of thrust, which when displaced across the entire shuttle would cause about 1.5 pounds of pressure per square inch leaving a very minimal impact crater. A final argument that Plait would discredit was that they explained that when you see the moon take off it should have moved all of the moon dust around the area, as the take off is so powerful, however this is not the case because even though this is the truth on earth, because the abundance of air causes dust and dirt to be spread long distances when a shuttle launches, there is no air on the moon so there will be no air to displace the force from the launch and cause the dust to move over a long distance. The only force present is the initial force from the shuttle. There are several other arguments as well but Phil Plaits is able to disprove them all, Its a sad day for Hoax believers everywhere. After the U.S. Embassy was bombed, Dr. Jenny Edwards went to the hospital to help with the people injured in the bombing. She performed Through Field Therapy (TFT) on some of these people to help with their pain and trauma. TFT involves tapping various parts of the body in a specific sequence. Dr. Jenny Edwards claims that a woman who was just staring into space with her arm bandaged and her hand limp, after TFT her pain and trauma were gone, her color came back to her face, she was moving her hand, and she was smiling and laughing. TFT is often used to help with weight loss, stress relief, and the relief of anxiety and trauma. The idea came from Dr. Roger Callahan and the techniques of acupuncture. Although TFT may seem like a miracle, there is no scientific evidence to prove its success and is based off of unsupported and discredited theories of Chinese philosophy and Kinesiology. Although many people still offer training corses in TFT, a substantial amount of research still needs to be done in order to be taken seriously in the scientific community. Dowsing, also known as water witching, is the practice of using a stick or some similar object to locate things hidden underground, like water, oil, buried treasure, even bodies. Several methods are used by dowsers in order to accomplish this. There are map dowsers, who hold a pendulum over a map to locate the desired object . Then there is the original method, called field dowsing, where the dowser simply walks around holding a dowsing rod and follow the direction in which the rod points. People who practice dowsing claim to have a special power enabling them to sense the energy, in the form of vibrations, of an underground object. In order to feel these vibrations they need to be holding a stick or rod of some type. Now how does this work? If you were to ask this, even experienced dowsers don't have an answer. They simply say it is a power they possess that enables them to find the hidden object. There is no science that backs up the legitimacy of dowsing, This along with the fact that even those who practice dowsing can't explain how it works leads to the conclusion that it simply doesn't happen. There just isn't enough evidence showing it's validity. This is an absurd, yet very common belief that actually many people participate in. Although it seems like common sense, society has fabricated the ridiculous notion of fingernails and hair continuing to grow long after someone has passed on. It's quite impossible actually, since this said-person is dead. But the reason why so many believe in this myth is because of the appearance of the human body post-mortem. In order for fingernails to grow, new cells need to be produced and this can’t happen without glucose. After the heart stops beating, oxygen supply to the brain is cut off. With no glucose store to rely on, nerve cells die within three to seven minutes. The skin around the fingernails retracts as it becomes dehydrated, making them appear longer. The human body begins to dry out, a natural process that takes place once a body begins to decompose. Skin begins to pull back towards the skull, and as the myth declares, this is what appears to trick many into believing that a dead man can still have stubble on his chin. It is a common and fiercely believed myth that the full moon causes people to change their behavior. Many believe that when a full moon occurs, strange and even paranormal activity occurs. Individuals often times adopt more deviant behavior and supposedly, crime rates spike whenever there is a full moon. There were even instances of police stations across the UK increasing their staffing on full moons. However, studies have been conducted that disprove this popular myth. The belief that the full moon causes mental disorders and strange behavior was widespread throughout Europe in the middle ages. In fact, lunacy stems from the Latin word for moon. This effect is called "The Lunar Effect" or "The Transylvania Effect". Numerous demographics have been tracked over the years, including suicide rates, accidents, murders, and even animal bites, all coming back with no indications of a relationship between the full moon and the incidents. But, humans still continue to believe this fallacy. Palm reading, also known as chiromancy, is a historical practice that can be traced back to Ancient times. The name comes from the word "cheir" which is greek for hand. 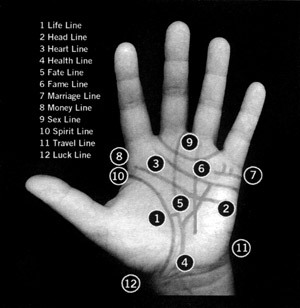 The idea of palm reading is that the lines on ones palm represent details about their personality and life. The palm can be split into three parts: fingers, middle of the palm, and lower palm. The fingers represent the mind, the middle of the palm is said to be the everyday life experiences, and the lower palm shows the health of the person. The idea that a person's hand can be read to determine these aspects of a person makes palmistry pseudoscience. There is no evidence that proves that there is actually any scientific basis. Even Sarah Larsen, a 3rd generation palm reader, explains how palm reading is pseudoscience. Although she attempts to claim that it is also science, that is contradicting in itself. People assume that because they are being told something about their life or personality that there has to be a way it fits in. They simply assume there is a connection when there is not. A palm reader will give a general reading that could fit for most people therefore to most it seems right. Naturally, our brains are a pattern seeking organ; we have evolved to look for patterns. The idea of missing a pattern is more haunting, so to speak, than assigning a pattern although it may be a false positive. Palm reading is just one aspect of pseudoscience that feeds off this very idea. In the early 1930's a man named Karl Zener developed an experiment in which he believed tested a person's level of ESP. In order to conduct this experiment Zener designed five white cards, each with its own unique symbol. The symbols included a hollow star, a hollow circle, a cross that looked similar to a plus sign, a hollow square, and three wavy lines. Five of each card was then shuffled together to form a deck of twenty-five cards each. These were known as "Zener cards", named after Karl Zener. This deck of cards was held by the experimenter and then another person would try to use ESP to read the experimenter's mind and see which card was on top. The receiver was not told whether they were right or wrong with their choices until they were done the whole deck, so they couldn't eliminate cards, and as a result increase the chance of getting one right through guessing. Next they would take a look at the results and see whether a person possessed ESP. A person would get about 20% correct base off of chance, so anything higher would show evidence of ESP. Based off of this criteria certain people tested positive for ESP. However after some people claimed these were results of the participants cheating somehow, so Zener began watching over the experiments more diligently to eliminate the possibility. After this was implemented the tests became less successful. Another factor that can be looked at when trying to explain how people were able to guess right so often without the use of clairvoyance or any other ability granted through ESP is the misinterpretation of statistics. People tend to disregard the bell curve when reading the results because they let their desire for ESP to be a reality cloud rational thinking. The bell curve states that most people are going to score around the 20% marker, which is the normal result when considering chance, but probability predicts that there will be a small percent that will score above the 20% as well as below it. Even now there are many websites online that allow people to take the Zener Card Experiment. This goes to show that people still believe that the results of these tests are accurate and shouldn't be disregarded as simply chance. Shermer, Micheal. "Why People Believe Weird Things: Pseudoscience, Superstition, and Other Confusions of Our Times"
One of the most well known conspiracy theories also doubles as a prime example of pseudo-scientific nonsense. Although this theory was released nearly 40 years ago, many people still believe the moon landing was a hoax. 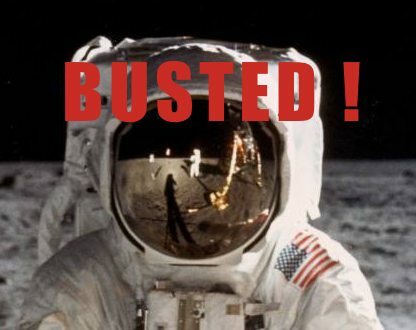 Even in this day and age between 6 and 20 percent of Americans believe the moon landing was a ruse and approximately 28 percent of Russians believe so as well. Despite the countless amounts of evidence proving that astronauts did in fact land on the moon, this theory continues to live on. The theory began with the writing of Bill Kaysing's We Never Went to the Moon: America's Thirty Billion Dollar Swindle. The book was written in 1974, a time where the American public was very distrusting our their government, especially after its recent Watergate scandal. From then on, countless documentaries and books have been devoted to disproving or ratifying this bizarre claim. Despite a multitude of scientific evidence proving the landing, many people are still skeptical about the landing to this day. are giving money to these greedy sadistic preachers instead of actually getting medical treatment. One type of magic is positive magic, also called sorcery, aims to bring about desirable events. Another type of magic is negative magic, also called taboo, aims to avoid unwanted ends. Homeopathic magic is the belief that "like produces like" and commonly involved the use of voodoo dolls. Magic and religion are often considered to me similar things. The difference is that magic is spells and rituals aimed directly at a specific end, and prayer involves the persuasion if an intermediate figure. Religion is centered around sacred things, which are things held to higher regards and rites are rules of conduct in respect to sacred things. Magic and religion have similar and rites elements. Religion serves a group and magic serves an individual, but religion also has individual prayer as well as group prayer. Magic is for future events and religion is for a current crisis. Rituals for death, birth, coming of age, and marriage create emotional standards and bring a community together. Lastly, magic is seen in old religion in holy water and food, chalice, dirt of church, and key to church. Traditionally, after the wishbone is removed from the turkey, it is dried out for a day and a game of tug-of-war takes place. The person with the larger half of the broken wishbone is the "winner" of one wish. This tradition began with the first-century Romans. They would fight over the broken bone, sometimes a bird bone instead, and believed that whoever had the bigger and better half was the lucky wisher. In the 1930s, the wishbone was a common image on North American good luck coins, but by the 1990s, much like the rabbit foot, it had fallen out of favor. Draw-A-Person tests, originally developed by Florence Goodenough in 1926, is a test said to be able to detect intelligence, personality and psychological problems. In the test, a person is asked to draw three different drawings; one is a man, women, and themselves. Once the drawings are finished, they are analyzed in detail and judged on the characteristics and style. These tests can range from aggressiveness, homosexual tendencies, relationship with parents to introversion or extroversion. For example, if a man draws himself with prominent, broad features, he is said to be "concerned about his manliness". Or, if a person draws themselves with large features, they are said to be "outgoing". Although this practice has been around for decades, no tests have proven it accurate or reliable. I took the test and my results were surprising. I was said to be outgoing and "concerned about my manliness". Nothing could have been more off than these results. It is outrageous to believe that one's drawing abilities can be linked to their intelligence or personality. Believers in this study make it seem that people can's just be bad at drawing-- that there is reasoning behind it.